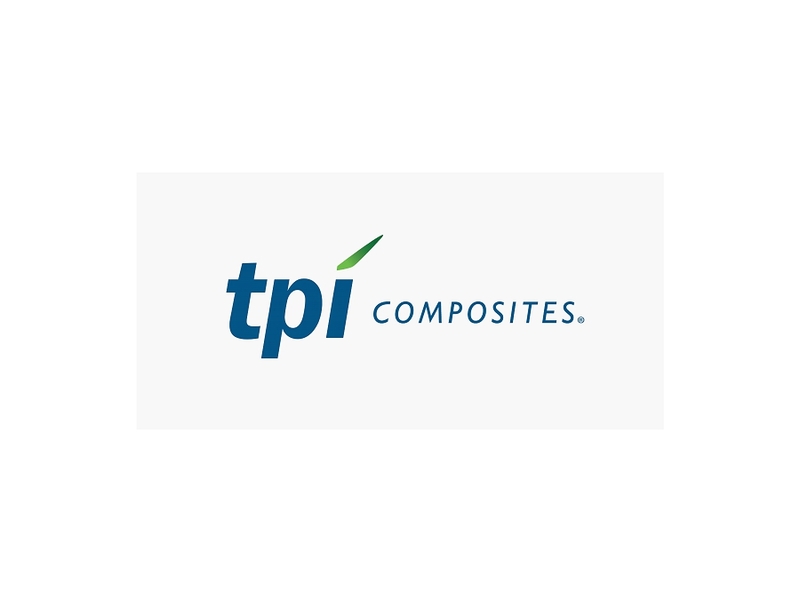 On August 7, 2018, TPI Composites, Inc. (the Company) issued a press release announcing its financial results for the three months ended June 30, 2018. A copy of the Company’s press release is furnished herewith as Exhibit 99.1 to this current report on Form 8-K and is incorporated by reference herein. 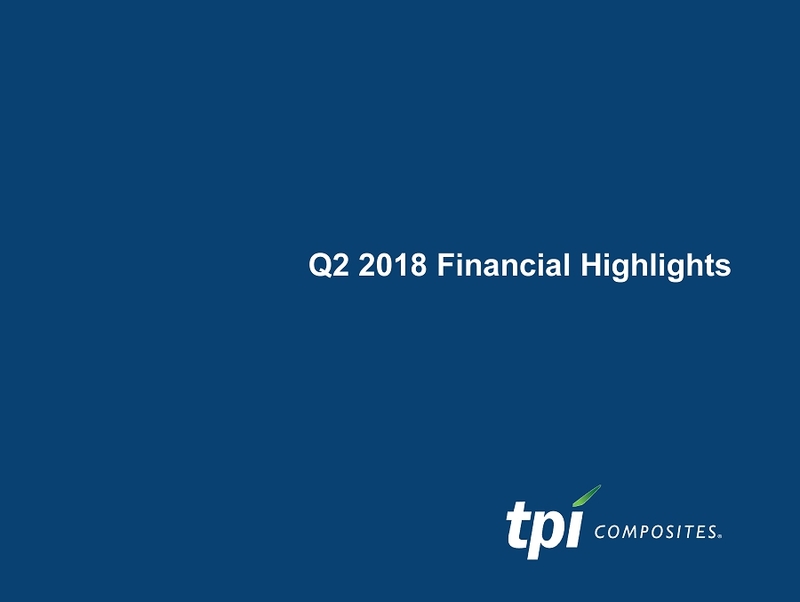 The Company also posted a presentation to its website at www.tpicomposites.com under the tab “Investors” providing information regarding its results of operations and financial condition for the three months ended June 30, 2018. The information contained in the presentation is incorporated by reference herein. The presentation is being furnished herewith as Exhibit 99.2 to this current report on Form 8-K. The Company’s website and the information contained therein is not part of this disclosure. The information in Item 2.02 of this current report on Form 8-K (including Exhibit 99.1) is being furnished and shall not be deemed “filed” for the purposes of Section 18 of the Securities Exchange Act of 1934, as amended, or otherwise subject to the liabilities of that Section. The information in Item 2.02 of this current report on Form 8-K (including Exhibit 99.1) shall not be incorporated by reference into any registration statement or other document pursuant to the Securities Act of 1933, as amended. 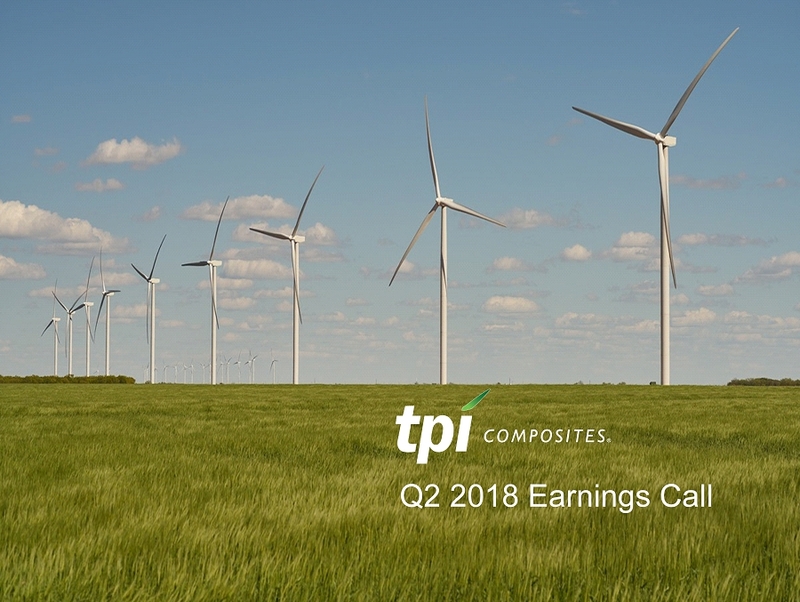 SCOTTSDALE, Ariz., Aug. 07, 2018 (GLOBE NEWSWIRE) -- TPI Composites, Inc. (Nasdaq: TPIC), the only independent manufacturer of composite wind blades with a global footprint, today reported financial results for the second quarter ended June 30, 2018. Number of manufacturing lines that are dedicated to our customers under long-term supply agreements at the end of the period. Dedicated manufacturing lines for Q2’17 includes seven lines for GE Wind that were not renewed after December 31, 2017. Number of manufacturing lines installed and either in operation, startup or transition at the end of the period. 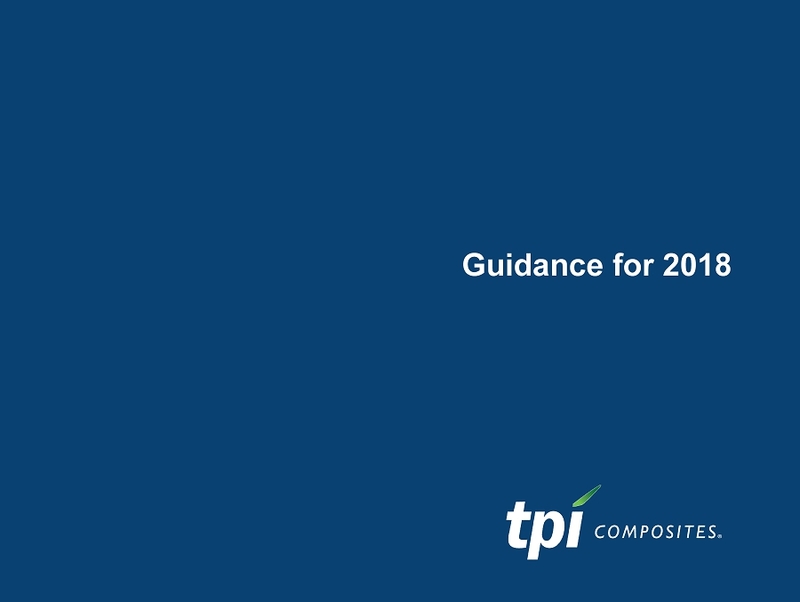 “Our customers continue to invest with TPI in adding new outsourced blade capacity ahead of the new line guidance we previously provided for 2018. In addition, they are tooling up new blade models more quickly than initially planned in order to aggressively drive down LCOE in response to economically driven global auction and tender processes. Given the accelerated pace of the conversion of our prioritized pipeline, the addition of a new customer, ENERCON, with an aggressive start of production date, and accelerated transitions requested by our customers, we are now expecting a total of 17 lines in startup and 17 lines in transition during the course of 2018. This is up from our previous guidance of 12 lines in startup and 14 lines in transition. 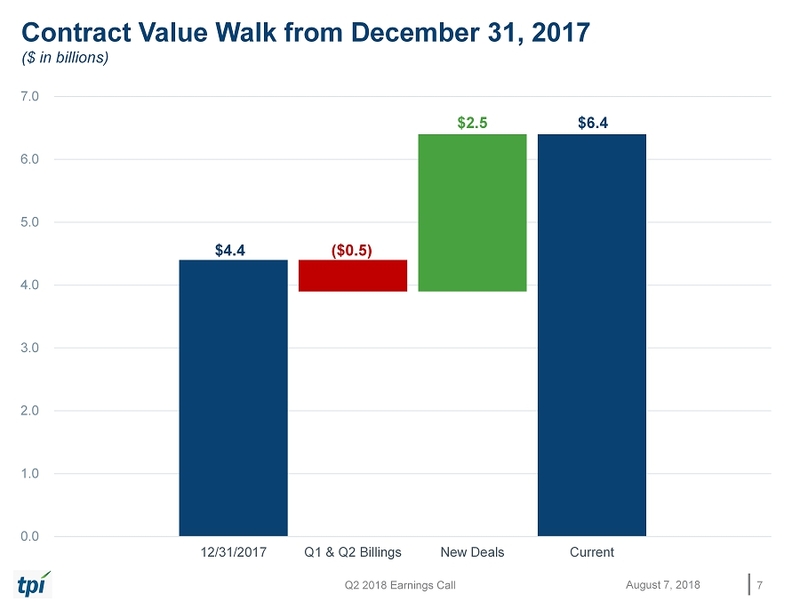 We are reaffirming our prior guidance for 2018 net sales and total billings however, the additional startup and transition costs of up to $10 million are causing us to reduce our EBITDA guidance range for 2018 to $65 to $70 million from our original range of $75 to $80 million. This additional investment positions us well for 2019 and our long-term goal of doubling the sales of TPI over the next several years and we are confident we will achieve a 20-25% three-year revenue CAGR through 2019. We remain focused on our strategy to expand globally, diversify our customer base, grow our wind business, improve our operational effectiveness, drive profitability and continue to drive down LCOE while continuing to develop and explore additional opportunities in other strategic markets,” concluded Mr. Lockard. Net sales for the quarter decreased by $9.0 million or 3.7% to $230.6 million compared to $239.6 million in the same period in 2017. Total billings increased by $6.3 million or 2.7% to $237.4 million for the three months ended June 30, 2018 compared to $231.1 million in the 2017 period. 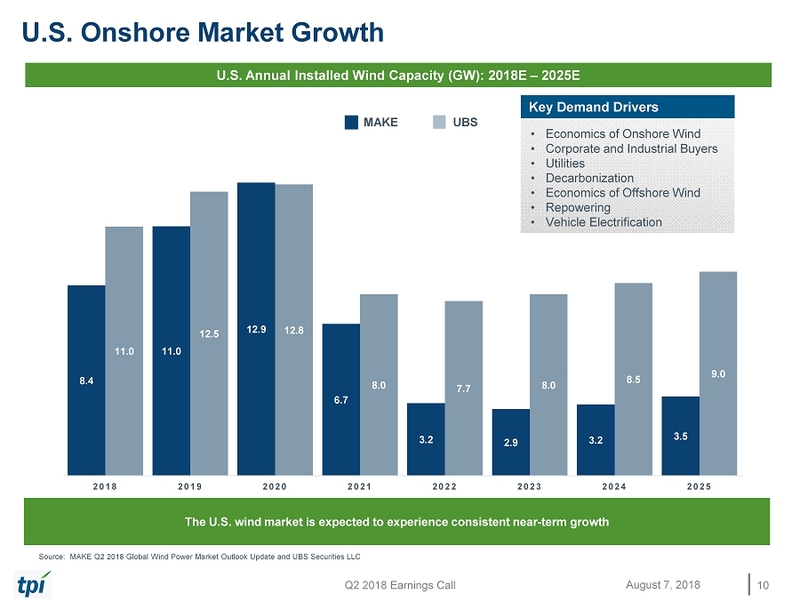 Net sales of wind blades were $206.4 million for the quarter as compared to $225.8 million in the same period in 2017. 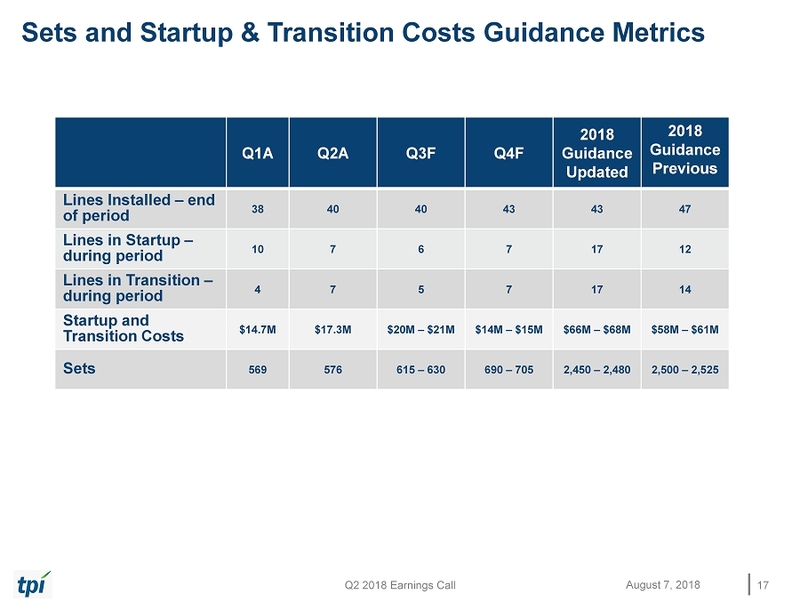 The decrease was primarily driven by a 17.3% decrease in the number of wind blades produced during the three months ended June 30, 2018 compared to the same period in 2017 primarily as a result of the increase in transitions and startups, the loss of volume from the expiration of contracts in Mexico and Turkey and a delayed customer startup. 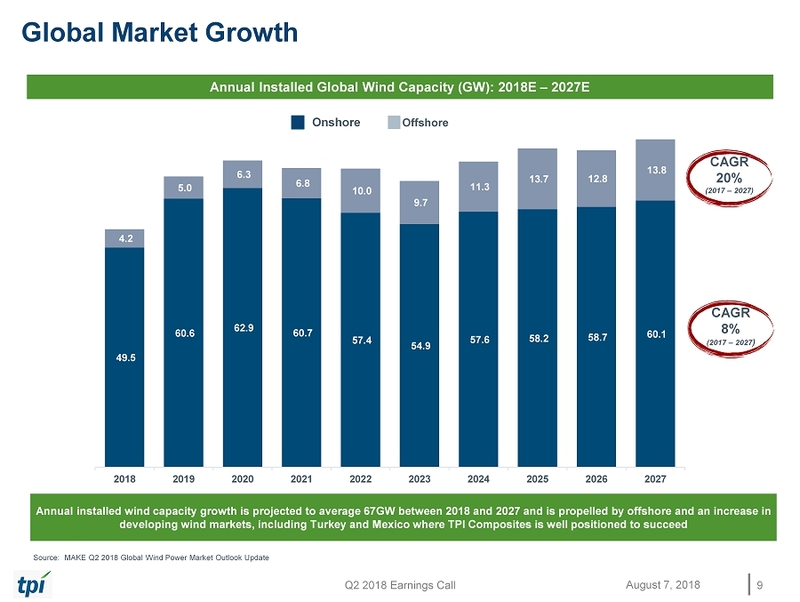 This was partially offset by higher average sales prices due to the mix of wind blade models produced during the three months ended June 30, 2018 compared to the same period in 2017 and by foreign currency fluctuations. The favorable impact of the currency movements on consolidated net sales and total billings were both 2.4% for the quarter. 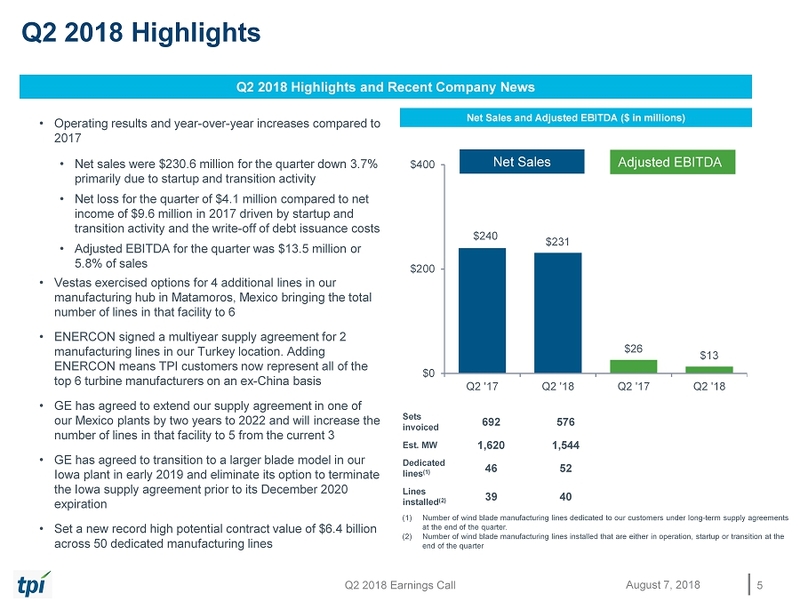 Total cost of goods sold for the quarter was $215.6 million and included aggregate costs of $17.3 million primarily related to startup costs in our new plants in Turkey and Mexico and for a new customer in Taicang, China and costs related to seven lines in transition during the quarter. This compares to total cost of goods sold of $209.7 million for the same period in 2017, which included aggregate costs of $10.5 million related to startup costs in our new plants in Turkey and Mexico and the startup of a new wind blade model for one of our customers in Dafeng, China. Cost of goods sold as a percentage of net sales increased by six percentage points during the three months ended June 30, 2018 as compared to the same period in 2017, driven by the $6.8 million increase in startup and transition costs and unfavorable foreign currency fluctuations, partially offset by improved operating efficiencies and the impact of savings in raw material costs. The unfavorable impact of the currency movements on consolidated cost of goods sold was 0.5% for the quarter. General and administrative expenses for the three months ended June 30, 2018 totaled $11.0 million, up slightly from $10.8 million for the same period in 2017. As a percentage of net sales, general and administrative expenses were 4.8% for the three months ended June 30, 2018, up from 4.5% in the same period in 2017. Net loss for the quarter was $4.1 million as compared to a net income of $9.6 million in the same period in 2017. 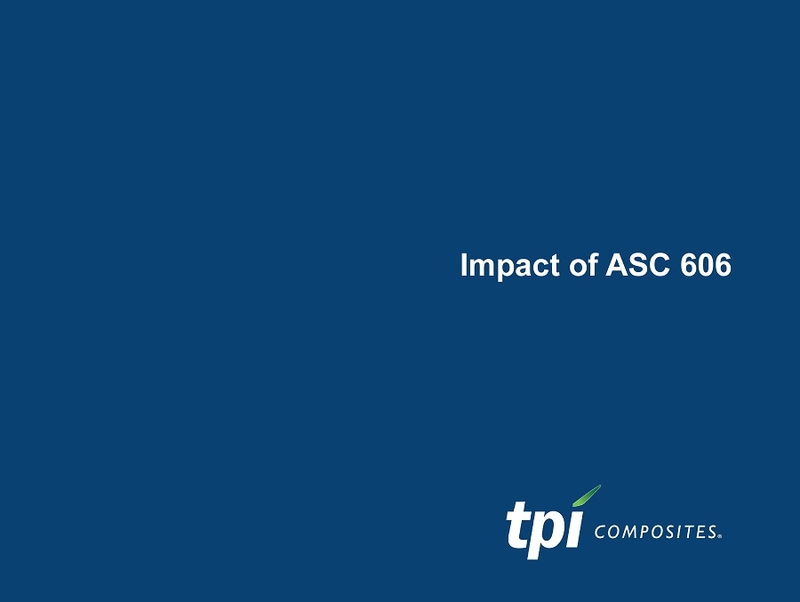 The decrease was primarily due to the reasons set forth above as well as a loss on foreign currency remeasurement and the write-off of debt issuance costs related to the refinancing of our prior credit facility early in the quarter. 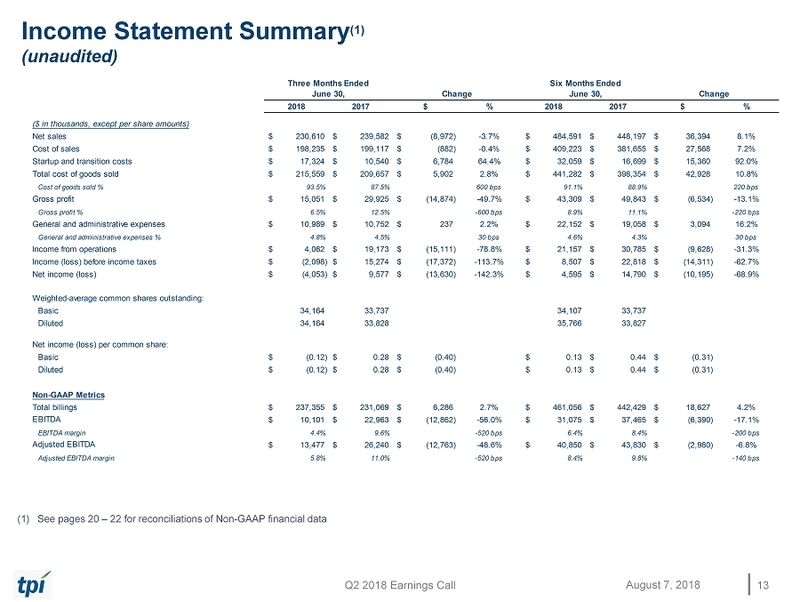 Diluted loss per share was $0.12 for the three months ended June 30, 2018, compared to earnings per share of $0.28 for the three months ended June 30, 2017. EBITDA for the quarter decreased to $10.1 million, compared to $23.0 million during the same period in 2017. EBITDA margin decreased to 4.4% compared to 9.6% in the same period in 2017. 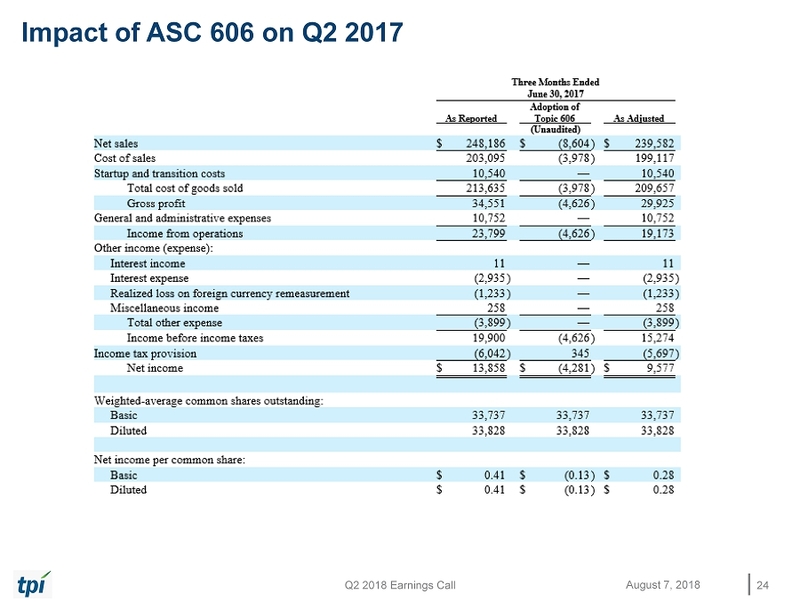 Adjusted EBITDA for the quarter decreased to $13.5 million compared to $26.2 million during the same period in 2017. Adjusted EBITDA margin decreased to 5.8% compared to 11.0% during the same period in 2017. The decline was driven primarily by the startup and transition activity and the resultant lost volumes. Capital expenditures were $30.6 million for the quarter compared to $9.8 million during the same period in 2017. Current year capital expenditures were primarily related to new facilities and expansion or improvements at existing facilities and costs to enhance our information technology systems. 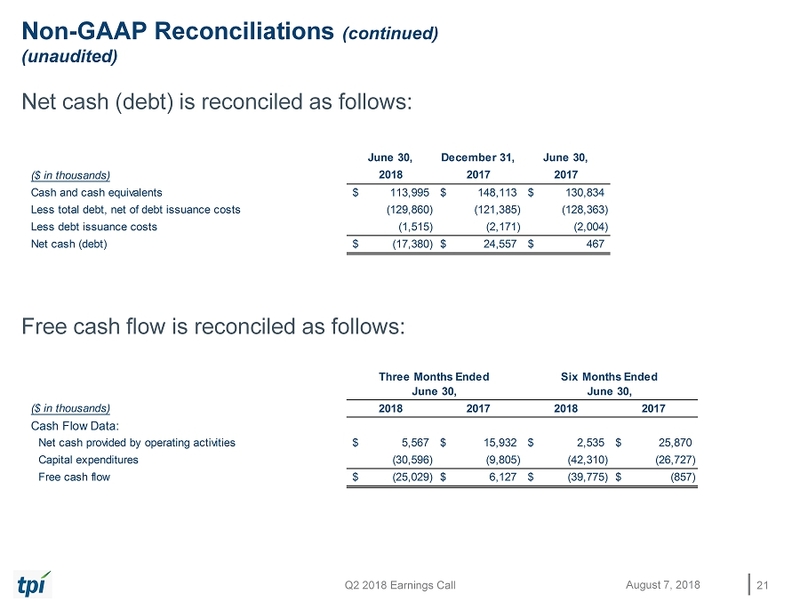 We ended the quarter with $114.0 million of cash and cash equivalents and net debt was $17.4 million as compared to net cash of $24.6 million at December 31, 2017. 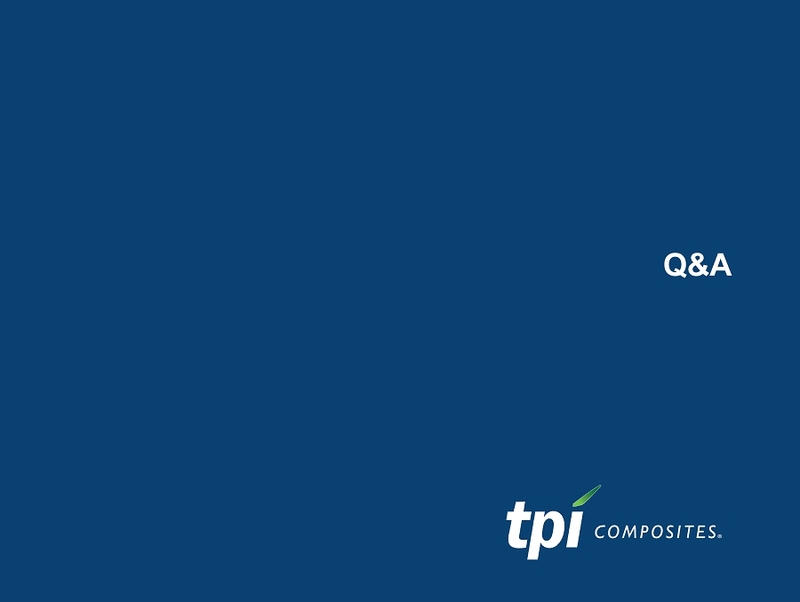 TPI Composites will host an investor conference call this afternoon, Tuesday, August 7, 2018 at 5:00pm ET. Interested parties are invited to listen to the conference call which can be accessed live over the phone by dialing 1-877-407-9208, or for international callers, 1-201-493-6784. A replay will be available two hours after the call and can be accessed by dialing 1-844-512-2921, or for international callers, 1-412-317-6671. The passcode for the live call and the replay is 13681393. The replay will be available until August 14, 2018. Interested investors and other parties may also listen to a simultaneous webcast of the conference call by logging onto the Investors section of the Company’s website at www.tpicomposites.com. The online replay will be available for a limited time beginning immediately following the call. 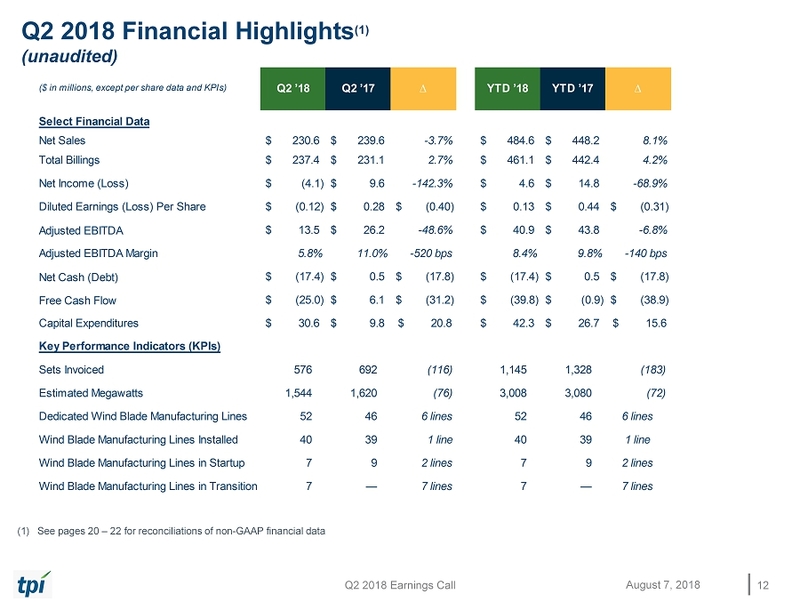 This press release includes unaudited non-GAAP financial measures, including total billings, EBITDA, adjusted EBITDA, net cash/debt and free cash flow. We define total billings as total amounts billed from products and services that we are entitled to payment and have billed under the terms of our long-term supply agreements or other contractual arrangements. 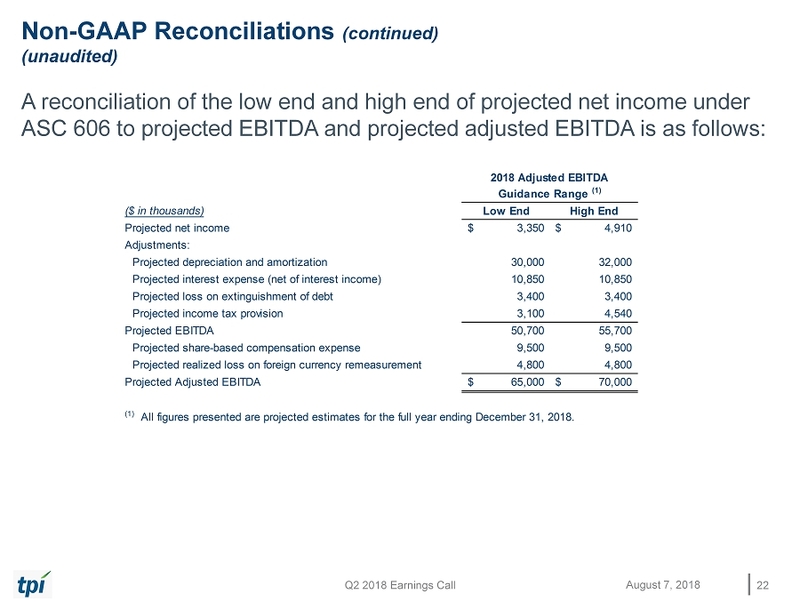 We define EBITDA as net income plus interest expense (including losses on extinguishment of debt and net of interest income), income taxes and depreciation and amortization. We define adjusted EBITDA as EBITDA plus share-based compensation expense plus or minus any gains or losses from foreign currency transactions. We define net cash/debt as the total principal amount of debt outstanding less unrestricted cash and cash equivalents. We define free cash flow as net cash flow generated from operating activities less capital expenditures. We present non-GAAP measures when we believe that the additional information is useful and meaningful to investors. Non-GAAP financial measures do not have any standardized meaning and are therefore unlikely to be comparable to similar measures presented by other companies. 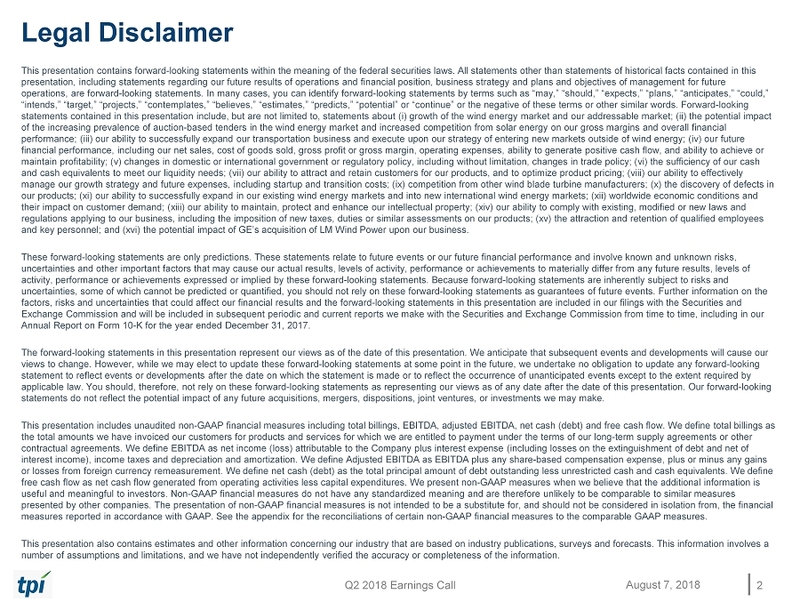 The presentation of non-GAAP financial measures is not intended to be a substitute for, and should not be considered in isolation from, the financial measures reported in accordance with GAAP. 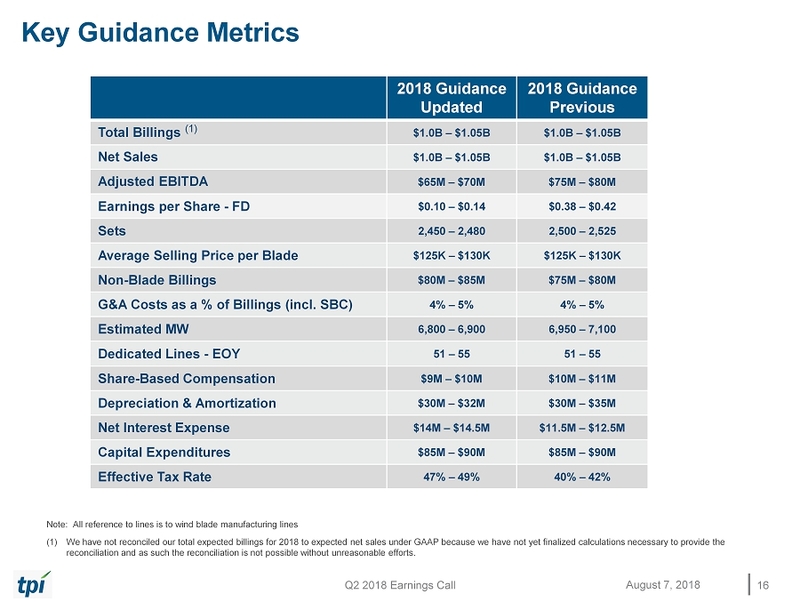 See below for a reconciliation of certain non-GAAP financial measures to the comparable GAAP measures. 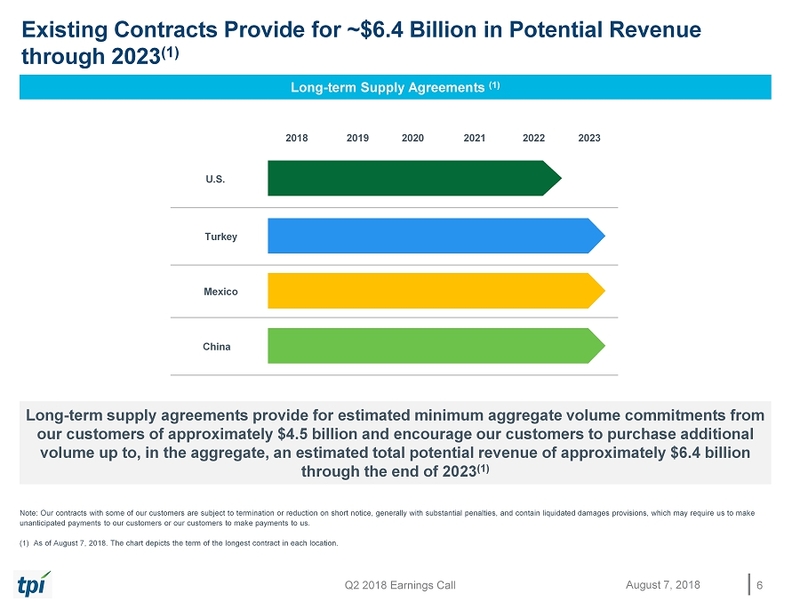 Q2 2018 Earnings Call Existing Contracts Provide for ~$6.4 Billion in Potential Revenue through 2023 (1) 6 August 7, 2018 Long - term Supply Agreements (1) 2018 2019 2020 2021 2022 2023 U.S. Turkey Mexico China Long - term supply agreements provide for estimated minimum aggregate volume commitments from our customers of approximately $ 4.5 billion and encourage our customers to purchase additional volume up to, in the aggregate, an estimated total potential revenue of approximately $6.4 billion through the end of 2023 (1) Note: Our contracts with some of our customers are subject to termination or reduction on short notice, generally with substa nti al penalties, and contain liquidated damages provisions, which may require us to make unanticipated payments to our customers or our customers to make payments to us. (1) As of August 7, 2018. The chart depicts the term of the longest contract in each location . 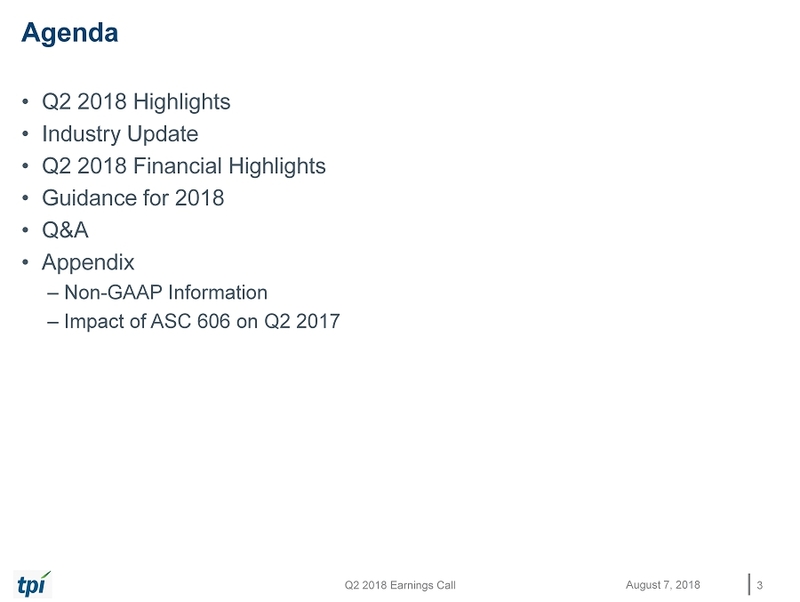 Q2 2018 Earnings Call Key Guidance Metrics 16 August 7, 2018 2018 Guidance Updated 2018 Guidance Previous Total Billings (1) $1.0B – $1.05B $1.0B – $1.05B Net Sales $1.0B – $1.05B $1.0B – $1.05B Adjusted EBITDA $65M – $70M $75M – $80M Earnings per Share - FD $ 0.10 – $0.14 $0.38 – $0.42 Sets 2,450 – 2,480 2,500 – 2,525 Average Selling Price per Blade $125K – $130K $125K – $130K Non - Blade Billings $80M – $85M $75M – $80M G&A Costs as a % of Billings (incl. SBC) 4% – 5% 4% – 5% Estimated MW 6,800 – 6,900 6,950 – 7,100 Dedicated Lines - EOY 51 – 55 51 – 55 Share - Based Compensation $9M – $10M $10M – $11M Depreciation & Amortization $30M – $ 32M $30M – $35M Net Interest Expense $14M – $14.5M $11.5M – $12.5M Capital Expenditures $85M – $90M $85M – $90M Effective Tax Rate 47% – 49% 40% – 42% Note: All reference to lines is to wind blade manufacturing lines (1) We have not reconciled our total expected billings for 2018 to expected net sales under GAAP because we have not yet finalize d c alculations necessary to provide the reconciliation and as such the reconciliation is not possible without unreasonable efforts. 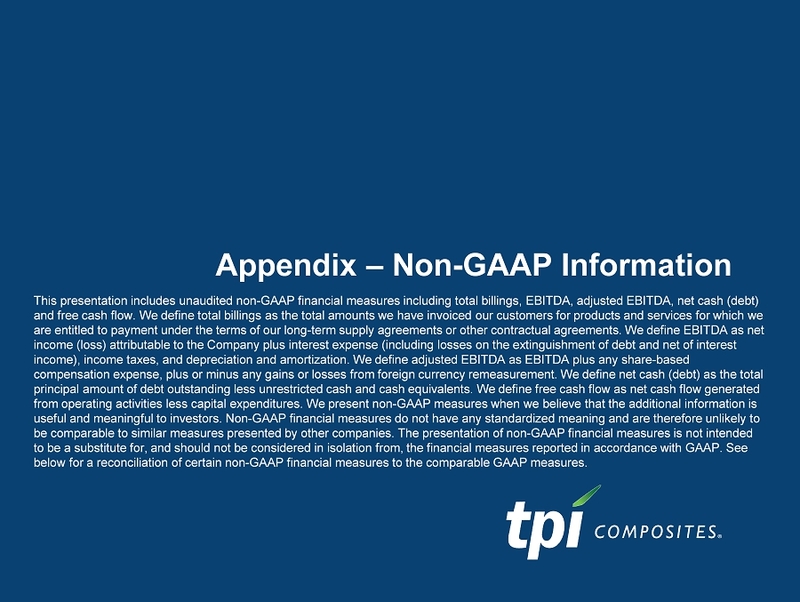 Appendix – Non - GAAP Information This presentation includes unaudited non - GAAP financial measures including total billings, EBITDA, adjusted EBITDA, net cash (de bt) and free cash flow. We define total billings as the total amounts we have invoiced our customers for products and services fo r w hich we are entitled to payment under the terms of our long - term supply agreements or other contractual agreements. We define EBITDA as net income (loss) attributable to the Company plus interest expense (including losses on the extinguishment of debt and net of in ter est income), income taxes, and depreciation and amortization. 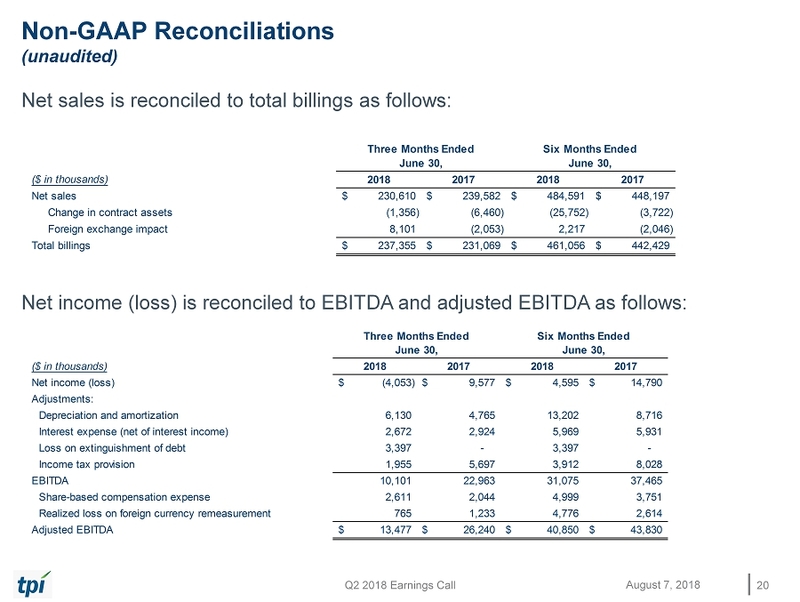 We define adjusted EBITDA as EBITDA plus any share - based compensation expense, plus or minus any gains or losses from foreign currency remeasurement. We define net cash (debt) as the to tal principal amount of debt outstanding less unrestricted cash and cash equivalents. 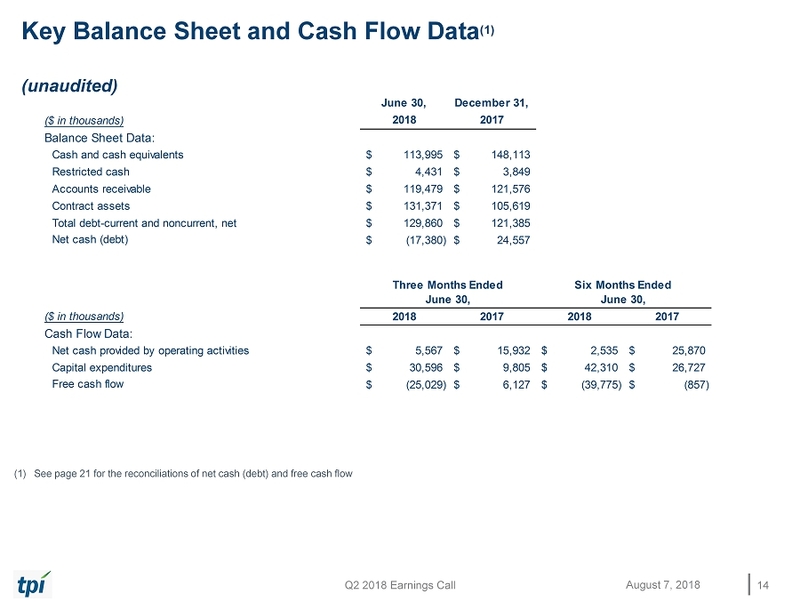 We define free cash flow as net cash flow g ene rated from operating activities less capital expenditures. We present non - GAAP measures when we believe that the additional informatio n is useful and meaningful to investors. Non - GAAP financial measures do not have any standardized meaning and are therefore unlikely to be comparable to similar measures presented by other companies. The presentation of non - GAAP financial measures is not intended to be a substitute for, and should not be considered in isolation from, the financial measures reported in accordance with GA AP. See below for a reconciliation of certain non - GAAP financial measures to the comparable GAAP measures.